The New York Times ran a story recently that quoted White House administration officials who were worried that the President sometimes tweets and chats via his private iPhone, instead of solely via the government-sanctioned for the purpose gear. The whole thing was met with some laughter and ridicule across the globe, with Chinese officials suggesting that maybe he should use a Huawei phone instead if intelligence sources are so worried about the matter. Needless to say, while Apple does its best to keep iPhones secure, a run-of-the-mill unit won't be much of a problem for eavesdropping by someone with malicious intent and the resources to apply it. Intelligence officials are worried that China or Russia might be listening on such calls with unpredictable consequences. That's not the first time "intelligence officials" are worried by actions of this administration, but it's sometimes hard to fathom if their tips come with other purposes than genuine threat worries. A recent Bloomberg report about Chinese spy chips in Apple's iCloud servers, for instance, now sounds like it may be a plant for political, China-bashing purposes by such sources, and Apple went so far as to ask for an editorial retraction. President Trump, however, just partially confirmed the New York Times story himself. 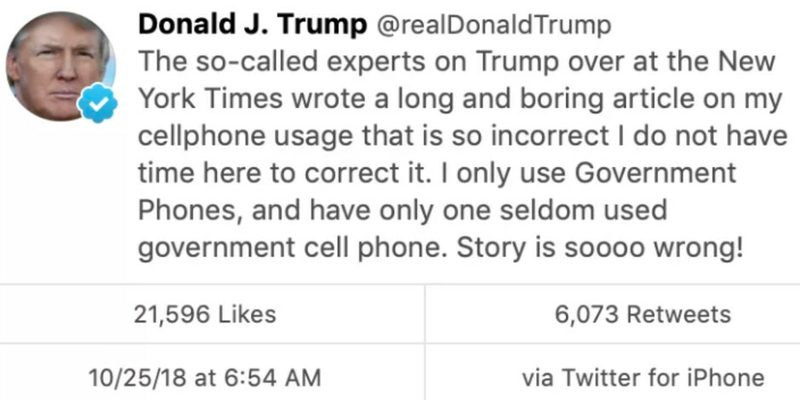 He tweeted in a rather convoluted manner that there is no merit to the claims he often uses his personal iPhone, saying that he has just "one seldom used government phone." That didn't preclude him from sending said rebuttal with the tag "Twitter for iPhone," rendering the report a bit more credible, save for the whole China/Russia eavesdropping part which would be hard to detect and prove anyway. And this guy, and according to him, has a very large ahbrainnn. Remember, he does love the poorly educated. Trump's twitter tweets are a treat to read. A total tongue twister, eh? T'Day! Can someone advise him on his tweets? Sounds like a teenaged girl ffs. There could be a valid reason to use a regular iPhone over a government issued one: the government issued one can be easily tracked by the government or its contents can be subpoenaed by Congress. Those will recall that in the recent Congressional review of those two FBI agents that they were able to read the text messages between the two because they were on government issued phones. Anytime you communicate on a government issued device you are subject to laws that basically mean your texts and calls and everything can be reviewed by those with judicial powers. Now you might ask: well what does he have to hide from the government unless he’s doing something wrong? Which is a valid point, but my point still stands that you would use a non government phone to avoid it being tracked or subpoenaed by the government. As I said before on this matter: he’s most likely using HIS iPhone for his personal life stuff. And uses government issues one for presidential stuff. You guys forget that trump has a personal life, he comes home to his wife for dinner and watches Tv on the couch. It was easier to not forget Obama had a personal life - most of his presidency was spent on golf courses. Joking. But my point stands. Presidents do have a personal life - that’s when personal phones are used. In other words if he was using government property (like government issued phone) for his personal life stuff - you’d all be bitching that he’s wasting taxpayers money on personal life. He's not sending personal texts to Melania on iMessage, mate. He's sending TWEETS to his 100+ Million followers and EVERYONE can see those tweets. So, kindly enlighten me; what exactly is he 'hiding' from government spies? He's being stubborn, mate. Dementia is what it is... P.S You didn't strike me as a Trump Stooge. Came as a bit of a surprise, lad. Oh well, G'Day! I’m not a “trump stooge”. But I will give fair assessment to anyone rather be blinded by some blind sheep rhetoric (technology wise or politically). I gave Obama a fair share, and now I’m gonna give trump the same. My bank account is the biggest driver for my political views (like 99%). I don’t care who the potus is as long as my money is growing and not shrinking. The faster it grows the more praise I will give the current administration either local or federal. Obama is a politician and he’s trained to hide these things better. Trump was not raised as a politician but a businessman - he doesn’t weld that specific politician demeanor to hide his true colors - and it has been obvious since before he was even elected. It only shines more light that he’s more of one of us than one of trained politician. He does have a real life outside the media’s eye. He has a past that is personal and professional, and he will conrinue that life once he’s out of the office. In that life - he does use an iPhone - and it’s none of our business what he does with it. His tweets are his opinions. Obama and Hillary also have opinions - I bet some are worse than trump’s, but those are trained to hide them. Savvy? iPhones cannot be hacked easily, not even by Russians or Chinese. I think Trump has vetted his personal phone via the secret service and has taken steps to avoid any hacking. Just read an article few days ago about government officials in European countries warning official agents not to use iOS. As for the celebrities photos that was leaked few years ago, it wasn't hacking. Emails were sent to these people, claiming that they're Apple and asking users to change their passwords because there was a possible hack on the way. So when they out their passwords in order to change them, or at least that's what they thought they were doing, they are basically handing out all their information to these spammers. iOS and Apple had nothing to do with it, it's just that people were to believe that these emails were actually from Apple. Wasn't the celeb 'hack' just social engineering and they were able to guess the passwords because every detail about celebs is known to the public? It was known as the fappening. While I wouldn't call that hacking, allowing unlimited password tries, thus allowing brute force, is hardly secure. After the fappening Apple changed it so 5 tries would block the iCloud account.
" a run-of-the-mill unit won't be much of a problem for eavesdropping by someone with malicious intent and the resources to apply it" According to this its not as hard as you think, if it was hard or not possible they wouldn't be worried about it. Just goes to show everyone, every phone is hackable to the right person. Literally nothing you said was true. Maybe the Russian part, but only because they don't need to hack him, he reports directly to Daddy Vlad. Literally nothing you said was true. Maybe the Russian part, but only because they don't need to hack him, he reports directly to Daddy Vlad. There's a reason iPhone aren't approved for such government use. But has he deleted any emails? 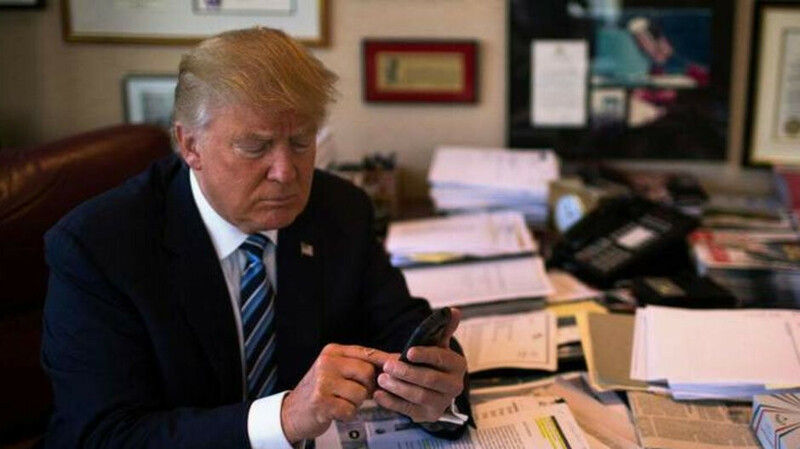 Does anyone know what phone the government issues to the President? I'm assuming they must not issue iPhones, based on the article and comments. Blackberry, or Android maybe? As a European, are Americans truly not embarrassed by electing this guy as your leader? As an American, we quit giving a s**t what Euros thought in 1776. Enjoy your freedom-less life in your Muslim infiltrated Euro-Nanny state. Some Muslims live right here in the USA (Las Vegas) to be exact, and root for the Yankees and Steelers. Moral to the story...don’t be a bigot dude.